The Midland and Great Northern Joint Railway link between Great Yarmouth and Sutton Bridge was opened in sections. The section between King's Lynn and Sutton Bridge had stations at South Lynn, Clenchwarton and Terrington and Walpole, and was opened by the Lynn & Sutton Bridge Railway in 1864. The section between King's Lynn and Great Yarmouth had twenty-two intermediate stations and opened under the Yarmouth & North Norfolk Railway from 1877 to 1881, the Lynn & Fakenham Railway between 1879 and 1882, and by the Eastern & Midlands in 1883. The whole system was closed on 2 March 1959, although some sections survive as paths. A number of stations, signal boxes, goods sheds and concrete mileposts remain. Formerly Yarmouth and Stalham Light, Lynn and Fakenham, and Lynn and Sutton railways. For full details see notes (S1) architectural plans (S2) and newspaper cuttings (S3) to (S24) in file. 2 August 1995. NLA aerial photography. Section of dismantled line visible on aerial photographs taken in Honing parish. 13 May 1999. NLA aerial photography. Line of former railway now used as A149 is visible. H. Clare (NLA) 13 December 2001. Stations on the King's Lynn to Sutton Bridge Line were South Lynn, Clenchwarton, Terrington, and Walpole. Stations on the King's Lynn to Great Yarmouth line were South Lynn, Gayton Road, Grimston Road, Hillingdon, Massingham, East Rudham, Raynham Park, Fakenham West, Thursford, Melton Constable, Corpusty and Saxthorpe, Aylsham, Felmingham, North Walsham, Honing (NHER 60561), Stalham, Catfield, Potter Heigham, Martham, Hemsby, Great Ormesby, and Caister-on-Sea. Ruth Fillery-Travis (NLA), 19 September 2007. --- Aerial Photograph: Edwards, D.A. (NLA). TF 9129AJ. --- Aerial Photograph: Edwards, D.A. (NLA). 1995. TG 3227K - P.
--- Aerial Photograph: Edwards, D.A. (NLA). 1999. TG 4118K - P; TG 4019A - B; TG 3921C - D.
--- Serial: 1965. Railway News. Railway News. November. <S1> Unpublished Document: Rose, E.. 1984. Midland and Great Northern Joint Railway. <S3> Newspaper Article: 1977. Eastern Daily Press. 8 February. <S4> Newspaper Article: 1977. Eastern Daily Press. 7 February. <S5> Newspaper Article: 1977. Eastern Daily Press. 8 August. <S6> Newspaper Article: 1982. Eastern Daily Press. 23 November. <S7> Newspaper Article: 1987. Eastern Daily Press. 10 August. <S8> Newspaper Article: 1989. Eastern Daily Press. 2 October. <S9> Newspaper Article: Lynn News. 1990. 6 November. <S11> Newspaper Article: 1996. Eastern Daily Press. 1 February. <S12> Newspaper Article: 1996. Eastern Daily Press. 23 November. <S13> Newspaper Article: Lynn News. 1998. 16 June. <S14> Newspaper Article: Lynn News. 1997. 4 May. <S15> Newspaper Article: Lynn News. 1999. 26 February. <S16> Newspaper Article: Lynn News. 1999. 8 June. <S17> Newspaper Article: 1999. Eastern Daily Press. 31 August. <S18> Newspaper Article: 1999. Eastern Daily Press. 16 September. <S19> Newspaper Article: 2000. Eastern Daily Press. 30 June. <S20> Newspaper Article: 2001. Eastern Daily Press. 26 January. <S21> Newspaper Article: 2001. Eastern Daily Press. 21 November. <S22> Newspaper Article: 2001. Eastern Daily Press. 17 December. <S23> Newspaper Article: 2002. Eastern Daily Press. 7 February. <S25> Monograph: Anderson, R. & Saunders. D.. 1999. 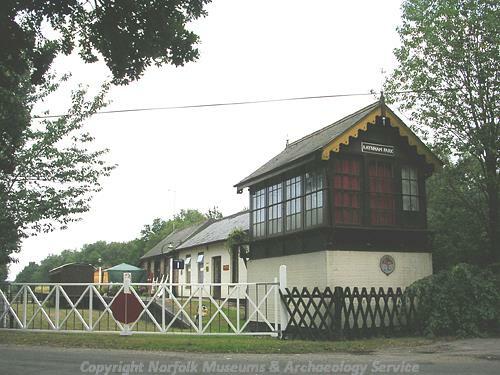 Rediscovering Railways: Norfolk Past and Present.. March.